Amelia Wagner and her boyfriend desperately wanted to adopt a cat, but finding an apartment where cats were allowed seemed next to impossible in San Francisco, where they live. They persisted, and at last they found one and signed a lease. Then the search for the perfect kitty began. They looked at dozens of cats on Petfinder and even had two meet-and-greets, but it took Dolores to win their hearts. Dolores’ expression hides a playful soul. 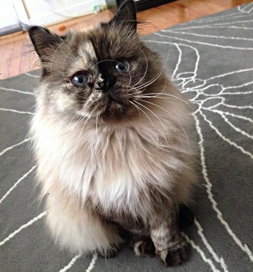 “At five years old, she was rather shy in her kitten-filled foster home,” Amelia says, “but was unmistakably beautiful.” The Persian cat’s Petfinder listing by Redwood Animal Rescue in Felton, CA, said she had been found stray and starving. It seemed incomprehensible to the couple that someone should abandon such a beauty, but there she was, needing a home — and there they were, quite taken with her. Their leap of faith landed them right in the middle of a perfect adoption.